Much of the information was generously supplied by the British Red Cross Society. It was decided to form Voluntary Aid Detachments (VADs) to provide medical assistance in time of war. By the summer of 1914 there were over 2,500 Voluntary Aid Detachments in Britain. Of the 74,000 VADs in 1914, two-thirds were women and girls. See ‘Reports of the Joint War Committee and the Joint War Finance Committee of the British Red Cross Society and the Order of St John of Jerusalem in England on Voluntary Aid rendered to the Sick and Wounded at Home and Abroad and to British Prisoners of War 1914-1919’ HMSO 1921. ‘5326 Witham. Mrs Christopher Parker, Faulkbourne Hall. The role of the British Red Cross in the provision of Auxiliary Hospitals during the First World War. One of the many important services the British Red Cross provided during the World Wars of the twentieth century was the provision of auxiliary hospitals and homes for wounded service men. This was a role the British Red Cross was prepared for, as the Society had been organised on the understanding that part of its function was to provide such support should conflict occur. What was not anticipated was how much the service would be developed, through its success, to provide such an important role in the recuperation of so many service men and civilians. At the outbreak of World War I, the British Red Cross Society and the Order of St John of Jerusalem combined to form the Joint War Committee in order to pool their resources of money and manpower with maximum economy and efficiency under the protection of the Red Cross emblem. Owing to the previous action of the British Red Cross in securing buildings, equipment and staff, many temporary hospitals were largely available for use as soon as wounded men began to arrive from abroad. However, on the outbreak of war both the Joint War Committee and the War Office were inundated with offers of buildings for accommodation. It was the Committee’s job to sort through these 5000 offers to assess the suitability of the premises for use as a temporary hospital. The buildings on offer were very varied and included anything from town halls and elementary schools to large and small private houses, both in the country and in towns and cities. Those deemed suitable by the Commission were established as Auxiliary Hospitals. These were attached to Central Military Hospitals, which directed the movement of the patients, who remained under military control. In all, there were over 3000 of these hospitals, which were administered under County Directors. They were usually staffed by: a Commandant, who was in charge of the hospital (except for medical and nursing services); a Quartermaster, who was responsible for the receipt, custody and issue of article in the provision store; a Matron, who directed the work of the nursing staff; and members of the local Voluntary Aid Detachment, who were trained in first aid and home nursing. In many cases ladies in the neighbourhood gave part-time service, although it was often necessary to supplement voluntary work by paid labour, such as in the case of cooks. Medical attendance was provided locally and was usually voluntary, despite the extra strain that the medical profession was already under at that time. The patients at these hospitals were generally the less seriously wounded and those in need of convalescence. The servicemen preferred the Auxiliary hospitals as the discipline was not as strict as in the Military Hospitals, conditions were less crowded and the surroundings more homely. It was partly their popularity and reputation for an excellent standard of care which, during World War II, was to lead to the extension of these convalescent services to include the provision of a broad range of rehabilitation therapies. Dear Ms Gyford, Auxiliary Hospital, Witham, Thank you for your email of 2 December. A VAD Hospital was established in Witham with 34 beds, in an infirmary lent by M.A.B. This was one of 33 VAD hospitals in Essex during the First World War. It was administered by the VADs of detachment Essex/26 under Dr K.C. Gimson, who was the Commandant of this detachment. The British Red Cross Museum and Archives hold Indexes of Personnel who served under the Joint War Committee of the British Red Cross and Order of St John during World War I. We hold a General Index of Personnel, an Index of those who served in Military Hospitals, and an Index of Trained Nurses. There is a record card for Dr Karl Gimson. He was a Medical Officer who made daily visits to the hospital at Witham from 1914 until 1919, he did this on a voluntary basis until he was paid in 1919. I was unable to find any service cards for Miss Mary Gimson or Miss Charlotte Alice Pattison. However there are several cards for a Sarah/Susan Vaux. Susan Vaux trained at the Middlesex Hospital between 1885 and 1886 and then went on to work in Birmingham, Ipswich, Andover, London and Essex. According to a volume of ‘The British Red Cross Society: The County Branches, Vol. I’, the work of detachment Essex/26 was as follows: ‘In August 1914, the Detachment prepared a hospital for troops passing through Witham and district, which hospital was taken over in October, 1914, by the S.M.F.A. [South Midland Division Field Ambulance], for the use of troops in the neighbourhood, until April, 1915. Thank you for your email of 6 December regarding the above. In theory we should hold at least one record card for everyone who worked for the Joint War Committee, whether they were orderlies, ‘nurses’, ambulance drivers or cooks. Other indexes hold information on people who were trained nurses, naval VADs or who worked in military hospitals. We also hold a series of published personnel lists and medal lists. These are all searched when a personnel search is undertaken. I did look for Miss Mary Gimson and Miss Charlotte Pattison but could not find either of them. Miss Gimson’s name was mentioned in ‘The County Branches’, which I have already quoted from, and it was when carrying out a search for her that I came across a card for Dr Karl Gimson (possibly related ?). The index card system was inherited from the Joint War committee after the First World War and is only searchable alphabetically. We have had other instances of cards not surviving for people who were known to work for the British Red Cross. We also hold a very simple card index for Auxiliary hospitals. There is a card for Witham – Bridge School, and it lists nine ladies [see next email for details] who worked in some capacity at the hospital under the Commandant Miss Gimson. They were probably trained nurses, although Miss Vaux is not mentioned, as they were paid but served for short periods of time. I am sorry I cannot be of more help. I look forward to receiving your donation and please feel free to get in touch if you have any more questions. Enquiry@redcross.org.uk To: janet@gyford.com Subject: Re: World War 1, Witham,. Kathleen Blood (Miss) [60 in 1914] / Essex / — / — / — / Witham Work Depot – 52 attendances (worked at home), Jan 1916 to ? 1919. Adeline Pearce / Essex / Special Probationer / October 1915 / March 1919 / Nursing at VAD Hospital Witham (4560 hours). Catherine Round / Essex / — — -Witham Work Depot. Emily Round / Essex / — / — / — / Witham Work Depot. Gertrude Luard [40 in 1914] / Essex / Nursing Member / October 1914 / March 1919 / At VAD Hospital Witham Essex (3271 hours). I hope this information is of interest to you. I am afraid I could not find any mention of the other names you gave. We would be interested in having a photocopy of the photograph you mention, especially if you have the names to go with it. Information about people is included in the table at the beginning. Some of them have info on the Work Depot, i.e. Witham Work Depot. Reg No 5,326, open 1 whole day a week. Depot started Dec 1914, worked on its own paying for everything till Nov 1917 when it was affiliated to the Central W R London till Feb 1919 when it closed. page 8. Accident – Mrs Elizabeth Hammerton of Beacon Hill, Wickham Bishops, broke leg when her bicycle skidded in gateway at home. Attended by Drs Gimson and Knight and ‘conveyed to Colchester in a motor, accompanied by some Red Cross nurses’. ‘Presentation to Canon and Mrs Ingles. Parting gifts from Witham parishioners’. Long report. Public Hall. Gifts included ‘Mrs Pelly, on behalf of the Working Party, presented Mrs Ingles with as handsome Japanese screen, in remembrance of the meetings at the Vicarage and the many gatherings Mrs Ingles had organised for their benefit. Canon spoke for her. Recognise vicars wives. page 8. ‘For the French wounded.’ Sale of the Tricolour by Boy Scouts under Rev D Field, raised £9 9s 6d. ‘Arrival of wounded. A contingent of wounded soldiers from the great battle near Loos arrived on Tuesday morning. Their removal from the station to the Red Cross Hospital in Bridge Street was expeditiously carried out under the superintendence of Dr K C Gimson, assisted by the V A Detachment under Mr Fred Hayward. Motor cars were kindly sent by Messrs Collingwood Hope, KC, JP, W Boulton, P E Laurence, JP, T Cullen, L Cullen, J Glover, F Brown, R W Wakelin and Mrs Gimson. The men were in the best of spirits in spite of their sufferings. There were seven stretcher cases’. page 8. ‘Wounded Soldiers. On Wednesday [??] wounded soldiers from Colchester arrived at the local Red Cross Hospital, where they are being cared for by Witham nurses under the direction of Miss Gimson’. Essex Weekly News, 22 October 1915.
page 8. List of events for ‘Our Day’ by British Red Cross Society and Order of St John of Jerusalem. National effort. Includes: ‘Yesterday at Witham success was achieved and was mainly due to the efforts of Miss Vaux, who had sole charge of the arrangements. Mr B C Afford’s shop was placed at the disposal of the Red Cross Society for the sale of gifts; and various guessing competitions were arranged by local tradesmen, some of whom devoted a large percentage of their day’s takings to the fund. The following ladies assisted at Mr Afford’s shop, and were kept busy throughout the day upon the varied assortment of preserves, fruits, vegetables, wearing apparel, cakes, etc., given by a large number of friends:- the Misses Pearce, Barker, Blood, Fowler, and Prichard. The ladies and gentlemen who paraded the streets selling flags were: Mrs Bullon[? ], Mrs E Chaplin, Mrs Howlett, Mrs Robberts [sic], the Misses Nora and Kathleen Brown, Graham-Browne and friend, Camp, Hanson, Hickmotte[? ], Maclaren, N Monday, Parsley, Salmon and Willink, and Mr Tom Abrey’. page 8.‘”Our Day” result’ Total yesterday was £83 3s 6d. ‘Mrs Hanson-Pullon gave the ton of coal she won in the contest to Miss Gimson’s Red Cross Hospital’. page 8. ‘”Our Day” result. The sum raised by the “Our Day” collection now reaches £90, with expectations of £100 before the week closes. One pleasing event was the handing in of an envelope (containing 3s 6d principally in halfpennies) by two little children. Upon the envelope was written in a child’s hand, “From Bertie’s and Edie’s money box, for the wounded”. page 10. ‘”Our Day” Fund. Up to yesterday the Witham fund totalled £100’. page 8. ‘For the Red Cross. As a result of the concert he gave last week, Mr B C Afford has cleared £10 for the Witham Red Cross Hospital’. ‘Soldiers’ Whist Drive’. ‘On Tuesday evening a whist drive for the 29 wounded soldiers in the VAD Hospital at Witham, under charge of Miss Gimson and members of the staff, was held in the dining hall, and was greatly enjoyed. The winners were: Ladies: 1. the Matron (Miss Houlton); consolation, Miss Luard. Soldiers: 1 Pt Kinnard; 2 consolation, Sergt Holmes. Sealed number, Pt Bush. The wounded men, who took part in the battle of Loos, greatly appreciated the fun of the drive’. Letter from Miss Gimson asking for allowance for gas consumed at the Red Cross Hospital. Agreed no fixed reduction but a donation of £1 11 6d. page 3. Intercession services, New Year, Witham. All Saints, attended by S M Royal Engineers. Also patients from hospital under Miss Gimson (commandant) and Miss Houlton (matron). Prayers by Rev Alan Gardner-Brown, U.P. St Nicholas, Congregational, Wesleyan, Ch of Holy Family also, just names of ministers. Essex Red Cross Society. War hospitals. Now 33 of them. Of which 23 are class A and 10 class B. One pic of new commandant, Essex Volunteer Regiment, Col R B Colvin. page 3. ‘”Our Day” at Witham. On Tuesday the second “Our Day” collections for the Essex Red Cross and comforts for Essex soldiers was held at Witham, and again proved a great success, £64 being taken, and there are still funds to come in. The effort was managed by Mrs C W Parker, Faulkbourn Hall, and Miss Vaux, Witham. The great feature of the day was the parade of a band of Red Indians, in full war paint, mounted upon a decorated trolley. The “Indians” were Miss Marion Payne, the Misses Willink, Master Billy Payne, and Master Hitchcock, with other assistants. At intervals they beat upon “tom-toms” and gave wild yells, which added a realistic touch to their exhibition. There was also a procession, led by the Scottish pipers’ band. A miniature dog ambulance, provided by Mrs Hill, Holfield Grange, was included in the procession, as well as a decorated vehicle, sent by Mrs Parker. The silver band of the Royal Scots played in the Market Place, and the bandsmen were entertained to tea at the Grove. Among the gifts were a hundred pounds of marmalade, made by Miss Vaux. Mr Afford placed his shop at the disposal of the organisers to dispose of the goods. There were numerous competitions, including one for guessing the name of a large doll, presented by the wounded soldiers in the Witham Red Cross Hospital, others being for a cake given by Mr W Brown, shoulder of mutton given by Mr W Goodchild, ham given by Mr H Pratt, chicken and fowl given by Mrs Parker and Mrs Mondy. Miss Pearce, of Ely House, a Red Cross nurse at the Witham Hospital, dressed in the picturesque costume of a gipsy, sold charms at 6d each. The following young ladies sold flowers :- The Misses Kathleen and Marjory Brown, Christine Pullon, Galpin, Howlett, and Robertson; while the other helpers included Messrs W Coker, F Hayward, and J Groves. Miss Gertie Luard and the Misses Blood assisted in the sale of goods in Mr Afford’s shop. page 6. ‘Tea. On Sunday afternoon Mr P E Laurence, JP, entertained the Engineers and the wounded from the VAD Hospital to tea on the lawn under the old cedars at his residence, the Grove. A band was in attendance’. page 6. ‘For the Red Cross’. proceeds of entertainments at the Public Hall for the Red Cross Hospital, were 17 guineas. ‘Red Cross Sale at Witham … successful jumble sale … at Witham Cattle Market. Local farmers and residents made handsome gifts of cattle, sheep, pigs, implements, and produce, all of which were sold or the benefit of the fund, and there was in addition a subscription of nearly £500 received. . Messrs Frank J Cullen, Cressing Temple, and Hugh Page were joint hon secs, and Mr Page was hon auctioneer, all the business of the auction being done gratis. There was keen competition for the lots, several articles being sold several times over. When the cattle were sold the auctioneer thanked all who had assisted, and said Witham had done extraordinarily well for the Red Cross. Details of animals. Also ‘Rings made from remnants of fallen Zeppelins made £1 18s 6d and £1 11s, and a brooch made from similar material 5s.’ Proceeds including the sub of £500, exceeded £1,000. Total yesterday up to £1,380 7s 9d, still proceeding. page 6. ‘£1,300 was raised by Mr Hugh Page’s sale in the auction yard for the Red Cross Fund’. Annual Meeting of Essex Red Cross. Chair Lady Gwendolin Colvin. Colonel Colvin ‘severed’, i.e. left. page 6. ‘Presentations. On Friday 30 past and present members of the Witham VAD assembled in No 2 ward at the Hospital, on the occasion of two wedding presentations, one to Miss Bower, matron, who is shortly to be married to one of her former patients, and the other to Miss Gimson, commandant. Col H Cooper, CMG, who was accompanied by Mrs Cooper, presided. Miss Gimson, on behalf of the staff, presented Miss Bower with a handbag, beautifully fitted, as a token of esteem and best wishes of the whole detachment for her future happiness; and Miss Bower, in reply, thanked all very much for the kindness show to her. Col Cooper, who made the presentation to Miss Gimson, said he was pleased to have the opportunity of saying how much he appreciated the work of the VAD. It had brought relief to soldiers, and it was a satisfaction to know that what was being done at Witham was also being carried on all over England (Hear, hear). The small VADs were of the greatest possible help. When the movement was started six years ago it was looked upon as fun, and perhaps it was in one sense, for he well remembered being dropped into a gooseberry bush in Dr Gimson’s garden when he was being practised upon by ladies (Laughter). The excellent work of their Commandant , Miss Gimson, during the past three years, had shown splendid results; and on behalf of the past and present members of the staff he felt proud and pleased to hand her a handsome writing set (Applause). The gift consisted of a leather bound case, blotter, pen tray, and inkwell, silver mounted and engraved, with a monogram. It was accompanied by a list of 48 members and an illuminated address, surmounted by flags of the Allies. The address read as follows:- ‘Presented to Miss Gimson on the occasion of her wedding by the members of the [???] Essex VAD as a small token of her excellent work as Commandant and of her courtesies consideration, towards all the members. Sept 1917”. Miss Gimson, in replying said but for the loyal co-operation of the staff if would have been impossible for her to carry on the work. (Applause) Miss G Luard expressed the thanks of the staff to Col Cooper, who, she said, was an old friend of the Hospital. The staff were then photographed by Mr Fred Hayward. Miss Alice Pattisson, the new commandant, takes over her duties this week’. ‘A Witham wedding. Miss Gimson and Mr Brandt. Popular. ‘Miss Mary Carwardine Gimson, only surviving daughter of late Dr William Gimson Gimson, MD, and Mrs G of Witham. For three years she had ‘occupied the onerous post of Commandant of the Witham Red Cross Hospital, and her war work greatly endeared her to the patients and townspeople alike’. Also esteemed family. ‘A notable feature of the auspicious event was the presence of nearly fifty Red Cross nurses in full uniform, and a large contingent of wounded soldiers’. Mr Brandt has been a motor driver with the army in France, invalided out and now ‘Government post in London’. Capt E C Gimson, RAMC, DSO, attended. ‘Is badly wounded, and was obliged to get about on crutches’. Church filled, ‘the Red Cross nurses and wounded soldiers occupying seats upon either side of the main aisle. The sacred edifice had been beautified by the Red Cross nurses who had served under the bride’. Misses Luard flowers on altar. Canon Galpin. Mrs Galpin at organ. Brother Dr W Douglas Gimson of Chelmsford gave her away. Clothes etc. Bridesmaids her nieces Kate and Betty G of Chelmsford. Dr K C Gimson best man. Canon Ingles gave address. When left church, wounded soldiers and Red Cross nurses lining the churchyard path, the soldiers making an arch with their sticks, tied with red ribbons. A pretty feature of the wedding was the drawing of the bridal carriage, to which floral ropes had been attached by the soldiers, to the residence of Mrs Gimson at High Street, where the reception was held.’ Lots of presents and who gave them. Several silver and several cheques. Photo m0191. 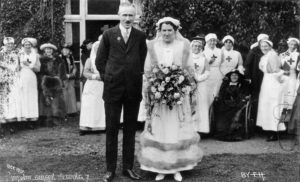 The caption is “Brandt Gimson wedding, Witham, Oct.1917”. Shows the gathering after the wedding of Mary Gimson and Hugh Brandt, described above. According to Ian Hook of the Essex Regiment Museum, Mr Brandt “appears to be wearing a silver War Badge, a silver lapel badge issued to servicemen invalided out of the service to show that they had ‘done their bit'”. There was a report in Essex County Chronicle, 12 October 1917. Mary was sister of Drs Ted and Karl Gimson. This group at the reception has the bride and groom in the middle. The group behind includes VAD nurses and workers, from the Red Cross Hospital, where Mary was Commandant. The four women facing the camera on the left are, left to right, Miss Eva Croxall (VAD, daughter of James Croxall, manager of Witham Gas works, afterwards Mrs Hayes), Mrs Nancy Mann (VAD, lived in Mill Lane, whose husband had a school at 124 Newland Street), Mrs Sybil Sherwood (of Kelvedon, showed race horses), Miss Kathleen Blood (owner of postcard album, daughter of solicitor). Immediately to the right of the bride is possibly May West (VAD). Behind the wheelchair is Adeline Pearce (VAD, daughter of Vaughan Pearce, churchwarden, lived at Littlefields, 41 Chipping Hill). In the wheelchair is Miss Ella Pattisson (sister of Alice, lived at Pelican Cottage, 16 Collingwood Road). Facing the camera extreme right, left to right, are Kitty Round (VAD, of Avenue House, 4 Newland Street), and Gertie Luard (a daughter of Admiral Sir William Luard of Witham Lodge). The location is probably the garden of The Gables, 127 Newland Street; the reception was at the home of Mrs Gimson the (bride’s mother) and she lived at The Gables according to the directories. page 5. ‘The Red Cross Hospital. The 35 wounded soldiers at the Witham Red Cross Hospital were given a happy Christmas. The Matron, Mrs R C Dunn, visited the wards, distributing presents at each soldier’s bed. Dinner consisted of roast turkey, plum pudding, mincepies, etc., provided by friends. Miss C A Pattisson, the commandant, presented each soldier with a leather pocket-case. In the evening a concert was held, Mrs Kemp, of Rosslyn House, with Lieuts Cane [sic, though Cave at Public Hall concert] and Latimer [sic though Lattimer at Public Hall concert], from Danbury, providing a capital programme. Mr B C Afford was a welcome visitor. At the close the wounded insisted upon singing “A Perfect Day”. Yesterday the soldiers were taken to a theatre at Chelmsford’. page 5, col 2. Under National Day of Prayer. Witham. ‘Nearly 200 men of A Co 3/2nd Vol Batt Essex Regiment paraded in the High Street under Capt R Duke Hill’ et al. Also present, Major W W Boulton in command and Colonel P E Laurence. Headed by Bridge Industrial School Band. To St Nicholas Church. Party of Boy Scouts under Scoutmaster Duncombe. At church, joined by regular police under Supt Coppin and special constables under Supt Perkins, VAD nurses under Miss Pattisson (Commandant), 26 wounded soldiers under Sergt Jenkins, munition workers and representatives of W A Corps. Many of public couldn’t find room. Major Boulton read lesson and Rev J B Haslam did prayers. Band accompanied hymns. Vicar, Canon Galpin, gave address. ‘If the Lord be God, follow him’. Collection, shared between Red Cross and St John’s Ambulance. page 6, col 6. Young People’s Guild. Congregational Church, Social in schoolroom and entertained the wounded from the VAD hospital. Revd Rees welcomed the men. Amusements provided. Refreshments served under management of Mrs Palmer. Output from local Red Cross Work Depot during last 3 years was 10,251 garments. Sent mostly to depot at Chelmsford to help the Essex regiments and Essex Red Cross Hospitals, to the French Wounded Emergency Fund, Lady Smith Dorien’s Fund, and others. VAD Hospital closed, after 4½ years. ‘At the outbreak of hostilities the Metropolitan Asylums Board placed at the disposal of the Red Cross Society the infirmary attached to Bridge Industrial School, which was opened in August 1914, by the local V.A.D. for the use of troops passing through the district, Miss Gimson being the commandant. In October of the same year the hospital was commandeered by the South Midland Ambulance, who remained in possession till June 1915. Between October and December 1914, the staff, with Mr Fred Hayward in charge of the men’s section, assembled at the railway station, night or day, as Red Cross trains passed through, and served hot coffee, tea, cocoa, bovril, and food, including after the first two trains an egg for every man – 999 wounded soldiers. The first convoy of wounded was received at the hospital in July 1915, and the number treated has been over 700, of whom 543 were Expeditionary Force men, including Australians, Canadians, and Americans. Only two men have been lost by death. After three years’ service Miss Gimson resigned her position as commandant on the occasion of her marriage to Mr H B Brandt, and Miss Pattisson undertook the duties, discharging them, as her predecessor had done, in a manner which won the esteem of both staff and patients. In connection with the closing seventeen Bridge School lads, who have assisted throughout, were entertained to a tea. On Friday Mrs Brandt, with her customary generosity, invited the past and present staff and a few friends, numbering, with the boys, nearly 70, to a farewell tea and concert, and in the course of the proceedings she handed to Miss Pattisson a travelling clock in red morocco case, bearing the following inscription: “Presented to Miss Pattisson by the staff of the Witham V A D Hospital as a token of their affectionate and grateful appreciation of her work as commandant from Sept 25 1917, to Feb 28 1919”. To Mrs Bannister, the cook, she presented a [???] kettle, inscribed “Presented to Mrs Bannister by the staff of the Witham V A D Hospital in recognition of her untiring devotion and patriotic work during the Great War 1914-1919”. Each gift was accompanied with an illustrated list of the 52 subscribers. Mrs H B Peecock said there were twelve original workers at the hospital, Mrs Cockburn, Mrs Chaplin, Misses Weston, Dixon, C Snell, G Luard, Pearce, Round, B Afford, M Fowler, and R Coppin, and Dr K C Gimson, medical officer, and it was felt some small recognition should be made to them as a token of gratitude from those outside the hospital, who realised their devotion to duty and hard work during the past 4½ years. She asked each of the ladies to accept a gold bar brooch and the Medical Officer a gold bar tie-pin, engraved “Witham V A D 1914-1919” [Applause]. ‘Owing to the shortage of cottage accommodation thirty London children have been houses in the V A D hospital for their fortnight’s country holiday, under the management of Miss Pattisson, and with the generous help of friends, especially Mrs Gibbs, of Bridge School’. Essex VADs Red Cross work. County Competitions at Danbury Park. 500 Red Cross and St John. Training in anti-gas measures. Team competitions – re anti gas, contestants in full clothing and masks – the imaginary casualties were the Boy Scouts. 35 VAD detachments in Essex with 840 members and 240 St John’s Ambulance Brigade. Results include: Mens teams – Anti gas – Witham 63, 82, max 100. Women’s teams, Witham not mentioned. Afford, Miss Beatrice. Essex Weekly News, 7 March 1919. Original member, still there 1919. Cook. Enrolled October 1914, discharged March 1919. Cooked 3 days a fortnight at VAD Hospital, Witham (1,812 hours). 30 attendances at Witham Work Party no 5326. Afford, Mr Bernard. Not sure about membership but he helped a lot. Had the newsagent shop on the corner of Guithavon Street (70 Newland Street). Bannister, Mrs. Essex Weekly News, 7 March 1919. Cook. Blood, Miss Kathleen (aged 60). Photo M191 in garden (not in uniform). Sister of William who was a solicitor. Witham Work Depot – 52 attendances (worked at home), Jan 1916 to ?1919. Chaplin, Mrs Caroline. Info from Edna Farren, her granddaughter, and Essex Weekly News, 7 March 1919. See photos esp from Mrs Farren. Original member, still there 1919. Charwoman. Enrolled October 1914, discharged March 1919 Scrubbing VAD Hospital Witham. 9 hours weekly. Cockburn, Mrs Florence. Essex Weekly News, 19 Oct 1917, 7 March 1919. Of Wickham Bishops?, lent house for wedding of Miss Bower. Original member, still there 1919. Nursing member. Enrolled October 1914, discharged March 1919. At VAD Hospital Witham, Essex – 3,947 hours. Coppin, Miss R. Essex Weekly News, 7 March 1919. Original member, still there 1919. Cowley, M L. BRC, Index of auxiliary hospitals. Crosford, Ivy. BRC, Index of auxiliary hospitals. Croxall, Miss Eva. Photo M191 in garden. Daughter of James, Gas manager. Not in BRC index of people. Dixon, Miss Helen Mary. Essex Weekly News, 7 March 1919. Original member, still there 1919. Nursing member. Enrolled October 1914, discharged March 1919. At VAD Hospital Witham, Essex – 3,460 hours. Dunn, Mrs (nee Bower). Essex Weekly News, 28 Sept 1917. Essex County Chronicle 28 Dec 1917. Matron, married patient 1917, continued as matron. Evans, Grace. BRC, Index of auxiliary hospitals. Fowler, Miss M. Essex Weekly News, 7 March 1919. Original member, still there 1919. Fowler, Miss Margaret. Not much local info. General service. Enrolled October 1915, discharged March 1919. Helped in kitchen and Dining Room at VAD Hospital, Witham, ditto Ardleigh, 2,251 hours. 60 attendances at Witham Work Depot and worked at home (between Dec 1915 and March 1918). Galpin, Miss. Not mentioned as actual member but helped a lot. Daughter of Vicar after 1915. Galpin, Mrs. Not mentioned as actual member but helped a lot. Wife of Vicar after 1915. Gimson, Dr Karl C. Essex Weekly News, 7 March 1919 et al. He and his brother Ted were already doctors in Witham. Ted was away in the army but Karl was not physically fit enough. Brother of Mary Gimson. Medical Officer. Original member, still there 1919. Gimson, Miss Mary. Various newspaper reports and photos especially of her wedding to Mr Brandt in 1917. Was Commandant of the Red Cross hospital till married. Sister of Doctors Karl and Ted Gimson. Hanson, Miss. Essex Weekly News, 20 Oct 1916. Organised ‘Our Day’. Hayward, Fred. Essex Weekly News, 8 October 1915. In charge of meeting trains. Head, Amy E. BRC, Index of auxiliary hospitals. Houlton, Miss Susan. Essex County Chronicle, 26 Nov 1915. Matron. Enrolled July 1915, discharged June 1916. Matron, Witham VAD Hospital. Whole time 11 months. Ingles, Miss. Not mentioned as member but helped a lot. Daughter of Vicar till 1915. Ingles, Mrs. Not mentioned as actual member but helped a lot. Vicar’s wife till 1915. Laurence, Miss Grace. Of the Grove. Surprisingly no local info about her involvement. 25 attendances at Witham Work Depot, first 18 months. Reg No 5,326, open 1 whole day a week. Depot started Dec 1914, worked on its own paying for everything till Nov 1917 when it was affiliated to the Central W R London till Feb 1919 when it closed. Luard. The Miss Luards listed below were all daughters of the late Admiral Sir William Luard of Witham Lodge. They had various other roles in the town. Luard, Alice (aged 52) BRC person index. General service member. Dining Room work at VAD, Witham. Luard, Edith Jane (aged 48) BRC person index. General services member. Enrolled October 1914, discharged March 1919. At VAD Hospital Witham, Essex (1500 hours). (On reverse of card: Witham Work Party 38 attendances). Also got BRCS War Medal. Luard, Frances Maud (aged 44). Miss F M Luard is listed in the book “For Dauntless France: An Account of Britain’s Aid to the French Wounded and Victims of the War” published by the British Committee of the French Red Cross (information by email from British Red Cross, January 2004). Luard, Gertie (aged 40). Photo M191 in garden and Essex Weekly News, 28 Sept 1917, 7 March 1919. Original member, still there 1919. Nursing member. Enrolled October 1914, discharged March 1919. At VAD Hospital, Witham, Essex (3271 hours). Also got BRCS War Medal. Luard, Lilian (aged 42). BRC person index. 1. Nursing member. Enrolled October 1914, discharged March 1919. Nursing at VAD Hospital Witham. General Service under Joint War Committee in France for year (Anglo-Belge Hospital and Le Treport, France). 2. Nurse. Enrolled 11 April 1916, discharge 21 November 1918. France Joint Committee. Mann, Mrs Nancy. Photo M191 in garden. Wife of Teacher. Not in BRC index of people. Methuen, Mrs L E . BRC, index of auxiliary hospitals. Pattisson, Miss Charlotte. Essex Weekly News, 28 Sept 1917, Essex County Chronicle, 28 Dec 1917, et al. Commandant 1917 onwards. Not in BRC index of people. Pearce, Adeline, of Ely House. Photo M191 in garden. Essex Weekly News, 7 March 1919. Report of ‘Our Day’, Essex County Chronicle, 5 May 1916. Original member, still there 1919. Special Probationer. Enrolled October 1915, discharged March 1919. Nursing at VAD Hospital Witham (4560 hours). Pelly, Miss Cicely. Nursing member. Enrolled October 1914, discharged March 1919. At VAD Hospital, Witham, and Clarendon Park Hospital, Guildford. 350 hours at Witham. Pelly, Mrs Mary. Enrolled December 1915, discharged November 1917. Work depot, 50 attendances. Reg No 5326, open 1 day a week. The Depot started Dec 1914. Affiliated to the C W Rooms London Nov 1917 to Feb 1919 when it closed. Rhodes, E M. BRC, Index of auxiliary hospitals. Round, Catherine. Photo M191 in garden, of Kitty Round. BRC person index. Essex Weekly News, 7 March 1919. Miss Round of Avenue House. Original member, still there 1919? (Miss Round). Witham Work Depot. Round, Constance, (aged 30). Photo M191 in garden. BRC person index. Essex Weekly News, 7 March 1919. Miss Round of Avenue House. Original member, still there 1919? (Miss Round). Nursing member. Enrolled October 1914, discharged March 1919. At VAD Hospital Witham, Essex (4783 hours). Round, Emily (aged 60). Photo M191 in garden. BRC person index. Mrs Round of Avenue House. Witham Work Depot. Saker, Ethel Essex Weekly News, 19 Oct 1917. ‘Sister’ ES gave away Miss Bower at wedding. Sherwood, Mrs Sybil. Photo M191 in garden (not in uniform so perhaps not member?). Race horse breeder, Kelvedon. Not in BRC index of people. Snell, Miss Constance. Essex Weekly News, 7 March 1919. Original member, still there 1919. General Service Member (Witham VAD Hospital). Enrolled October 1914, discharged March 1919. Kitchen work at VAD Hospital. 1,456 hours. Snell, Miss or Mrs Amy. Perhaps same as below. Secretary. Enrolled March 1917, Discharged March 1919. Secretary at VAD Hospital, Witham, 2 hours daily. Snell, Miss or Mrs Amy Catherine. Perhaps same as above. Lay Worker. Enrolled and discharged 1916. Part-time 525 hours. Helped as lay worker with Secretarial work (Stamp of Rivercourt Hospital, Maldon, Essex). War Service Hospital. Stevenson, Miss Flora Clare. General Service member. Enrolled October 1915, discharged November 1918. Help in dining room at VAD Hospital, Witham, 3 days a week for 6 months. Swift, Lily. BRC, Index of auxiliary hospitals. Tuohy, B H, Mrs. BRC, Index of auxiliary hospitals. West, May. Photo M191 in garden. Various roles in Witham. Sister of Cissie. Not in BRC index of people. Weston, Miss Frances. Essex Weekly News, 7 March 1919. Original member, still there 1919. Quartermaster. Enrolled October 1914, discharged March 1919. At VAD Hospital, Witham, Essex, averaged 1 day a week. Witham Work Depot [doesn’t give hours there, just the same info about the depot as under Gracie Laurence].